Water Wells offers a wide variety of pumps to choose from. 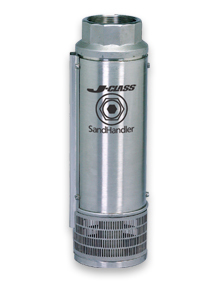 We are authorized dealers (sales and service) for Franklin Electric’s J Class water pumps. Franklin Electric’s submersible J-Class brand, the company’s original pump line, offers Tri-Seal, high capacity, environmental and boosting pumps ideal for a variety of applications. Combined with the availability you need, these pumps improve efficiency and minimize wear, even when handling abrasives. When you need service we’re here to help. There are several things that need to be addressed when a pump simply has stopped pumping or appears to be pumping at a much slower rate. The windings in the motor need to be tested to see if they are within manufacturers specs. If there is a leak somewhere between the pump and the pressure tank that could explain the lack of water or if the power to the pump has been interrupted. If it is determined that the pump needs to be replaced the well is measured for total depth, water level, and casing level. The amount of water required is also a factor in determining the size of the pump. Water Wells Inc. uses all brass and copper fittings, PVC drop pipe (when applicable) and the most reliable pumps on the market. We warranty our pumps for 5 years and our labor for 1 year.